Truck drivers deliver virtually everything needed to sustain modern life, and Sept. 10-16 they are getting something in return: Thanks. During National Truck Driver Appreciation Week that “thanks” will come in the form of highway billboards and company picnics, public proclamations and media interviews, and maybe a few extra hugs from family and friends. At Fyda Freightliner truck dealerships in Ohio, Pennsylvania and Kentucky, drivers are encouraged to stop in for free food and gifts. Truck stop operator Pilot Flying J Inc., which is based in Knoxville, Tenn., said it will celebrate Truck Driver Appreciation Week by giving away 100 million loyalty points that can be redeemed for goods and services valued at $1 million. The company will award more than 65,000 prizes, Parent said. American Trucking Associations helped to launch a national week of recognition for truck drivers in 1988 as part of a campaign to enhance the public image of the industry. In recent years, those efforts have coalesed around Trucking Moves America Forward, a fundraising and public education program. Through TMAF, travelers in 13 states will see billboards with images of drivers and their families. Trucking Moves America Forward billboard. On Sept. 12, members of ATA’s America’s Road Team will be in Nashville, Tenn., to conduct satellite interviews with local and national media representatives. In addition, radio and TV spots thanking truck drivers are expected to air across the country, along with op-eds and letters to the editor. “A number of states have gotten proclamations from their political leaders announcing National Truck Driver Appreciation Week,” Barna noted. ATA is working with members of Congress to honor truck drivers with remarks from the floor of the House and Senate as well. Denny’s travel centers are giving drivers discounts on food and prizes, including a $500 gift card, throughout September. “This serves as a small token of our appreciation for these drivers’ hard work and dedication,” said Steve Henry, senior director of field marketing for Denny’s in Spartanburg, S.C.
Rudolf Foods Co., which makes Southern Recipe pork rinds and other snack foods, invited drivers to submit photos of themselves and their rigs to win a $2,500 prize and a donation to the St. Christopher Truckers Development and Relief Fund, an organization that provides financial help to drivers in need. Jane Jazrawy, chief executive of CarriersEdge, a provider of online training to the trucking industry, said fleets that are celebrating drivers with cookouts and giveaways of hats and shirts this week need to show that commitment throughout the year. 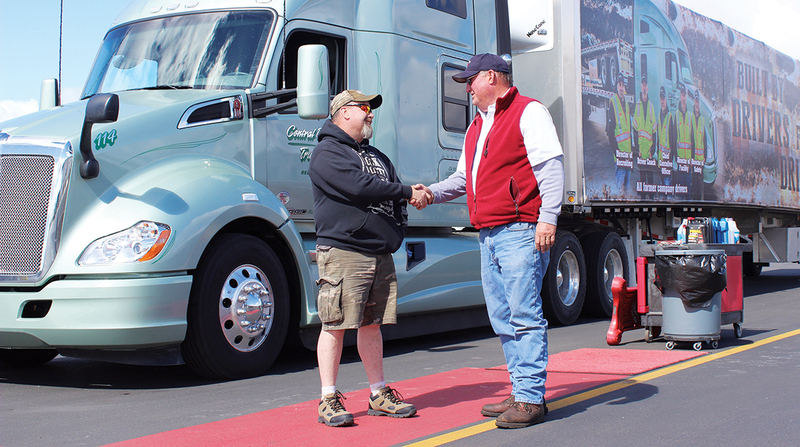 Fleets such as Central Oregon Truck Co. in Redmond, Ore., for instance, offer concierge services at terminals to help drivers with personal and professional services while they are on the road, discounted or free work gear or uniforms and vouchers for safety shoes and jeans.